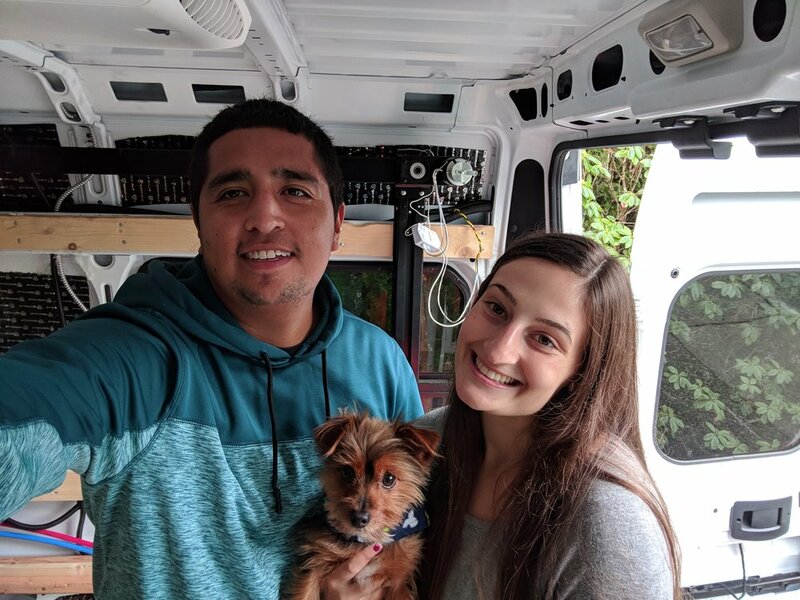 We are a couple in our mid-twenties from Seattle Washington, hoping to explore the world with our little Yorkie JJ. Jon is a former computer programmer that is always coming up with new and innovative ideas. He is drawn to the idea of entrepreneurship and pursuing your own dreams, even if it’s not what is considered “normal” to most people. Rachel is a certified yoga teacher that loves traveling to new places. She has a passion for helping others and is always looking for ways to give back. We decided to become full time van lifers because we felt trapped in our daily routine of working just to be able to live instead of being able to enjoy our time together. We love to travel and explore new places and we thought van life would be the perfect way to do so. We made the choice to no longer allow society to shape our idea of what our lives should be. Instead we are able enjoy each moment and experience each day as a new adventure. We hope to inspire others to do whatever brings you happiness and to not let anyone or anything hold you back from living your dreams. We plan to give back in any way we can throughout our travels. Follow us along our journey!